To commemorate the events described in the Iliad as well as to make the visit in Troy more interesting, a so-called replica of the wooden horse used by the wily Odysseus to outwit the Trojan warriors has been erected at the entrance to Troy archaeological site. The wooden construction, currently welcoming the visitors to Troy, arouses mixed feelings. Some people feel outraged at this superficial treatment of the ancient site. Others happily take photos of the horse or climb inside it. Trojan War - a myth or a historical fact? The history of the Trojan War, or actually its last phase, was presented in the Iliad created by the ancient bard Homer. It is not known exactly when this epic poem was composed. Some people believe that it happened shortly after the war, which was supposedly fought in the 12th century BC, while others, including Herodotus, suggest the 9th century BC. The cause of the outbreak of the Trojan War is probably known by almost everyone. As a reminder, of course, it all started because of a woman, the most beautiful one - Helen, wife of Menelaus. The prince of Trojans - Paris - won her thanks to the favorable judgement for Aphrodite, the Greek goddess of love, in the first-ever beauty contest. Paris abducted Helen from Mycenae and brought to Troy, to the castle ruled by his father - King Priam. The abduction of beautiful Helen obviously upset the Greeks, even more so as her husband Menelaus was a legitimate brother of Agamemnon, the king of Mycenae. Greek troops crossed the Aegean Sea and besieged Troy for ten years. In the end, the city fell, mainly due to the cunning of Odysseus, who came up with the idea of ​​constructing a wooden horse. The bravest Greek warriors hid in this bizarre structure, and the remaining troops pretended to withdraw. Jubilant residents of Troy took the horse inside the city and began to celebrate the end of a devastating war. Then, under the cover of night, Odysseus and his companions opened the gates of the city, letting the Greek army in. The slaughter began, followed by complete collapse and burning of Troy. However, the identification of the ruins located on Hisarlık Hill with the legendary Troy has long been questioned. The events described in the Iliad are not considered by the researchers as a description of the actual history of the city. It is thought that the epic is a compilation of traditions, myths, and stories handed down from generation to generation, concerning different historical events, distorted by time and the ephemeral human memory. Descriptions left by Homer leave no doubt as to the fact that the Trojan War had been fought in the Troad region, near the Dardanelles. Researchers have long tried to reconcile the poetic vision presented in the Iliad with the historical events that occurred in the late Bronze Age in the Troad. Clay tablets, discovered in the capital of the Hittites - Hattusa - provide two names that may be the missing link in this history. The first name is Wilusa, the land in the north-western Anatolia, whose capital could be Troy. The second name is Ahhiyawa, meaning most likely Mycenae - if we remember that the Greeks called themselves as Achaeans. The memory of the ongoing conflicts between Wilusa and Mycenae during the restless period of the late second millennium BC could survive as the story of the Trojan War. On the other hand, the archaeological work carried out on the territory of Troy have not provided any convincing evidence that the city was destroyed by the invaders from Greece. It is known, however, that a settlement on Hisarlık Hill was then an important regional center, well-fortified and consistently rebuilt after subsequent devastations caused by fires, earthquakes, and wars. In the course of the archaeological work in the area of the settlement, the researchers tried to link individual layers to the Homeric Troy. Heinrich Schliemann was convinced that the burned citadel belonging to Troy II and its so-called Treasure of Priam constituted a sufficient proof of the truth of the story presented in the Iliad. However, subsequent studies have shown that Troy II was more than a millennium older than the Mycenaean civilization. Dörpfeld, who was responsible for excavations of the Late Bronze Age settlement, argued that proper identification of Homeric Troy points to Troy VI, but his argument was undermined by Blegen. This researcher argued that small buildings and food storages from Troy VIIa indicate precisely that this layer was a city besieged by the army from Greece. We now know, however, that at the same time, there was an extensive settlement outside the city walls, and the interpretation of traces of fire and several human bones as a proof of the waged war is highly controversial. No matter if the famous Trojan War was actually fought in the area, Hisarlık Hill has an invaluable significance for studying the history of this region of Asia Minor. It provides plentiful sources of information about the development of urban centers in the Bronze Age. However, Homer's work has played but an important role in culture and art for many centuries. Th visitors of the ruins of Troy on Hisarlık Hill should be aware that they follow in the footsteps of great historical figures. This location was visited both by the Persian ruler Xerxes and Alexander the Great of Macedonia, as well as many Roman emperors and Ottoman Sultan Mehmed II the Conqueror. Even the landing of Allied troops on the Gallipoli Peninsula in 1915 was presented as a "new Trojan War." Troy is located on a 15-meter-high hill that hides the traces of successive waves of colonization. Although once it lay near the coast, now, as a result of the alluvial activity of river Scamander (now Karamenderes), it is 5 km away from the sea. The location of the ancient settlement - on the coast, on the border of two continents, and at the intersection of trade routes from Asia Minor to the Balkans and the Aegean and the Black Sea - was crucial to the development and prosperity of its people. In order to systematize the history of Troy, archaeologists divided it into nine historical periods, corresponding to the successive layers of settlements, which in turn often are divided into subperiods. The history of the city dates back to the early Bronze Age i.e. around the year 3000 BC, when the first settlement, marked now as Troy I (3000 BC - 2550 BC), was most probably established here. It was a small village, built on terraces on the coast, consisting of interconnected stone and brick houses. The settlement was surrounded by stone walls, repeatedly strengthened. The items found in the earliest layers are mostly dark, hand-produced ceramics, and copper objects. Today, you can admire the restored gate to the village, and one of the houses. Troy II (2550 BC - 2300 BC) actually consists of 7 layers lying one on the other. Each of them was surrounded by city walls, and a monumental ceremonial gate led into the interior of the settlement. The settlement from this period was twice destroyed by fire. In addition, at this time, the first buildings were erected outside the ramparts, creating a vast settlement surrounded by a palisade. It was discovered relatively recently. Archaeological finds from this period include ceramics produced using a potter's wheel, and silver, gold, and amber jewelry. Priam's Treasure found by Schliemann has been dated to this period of Troy history. Troy III, IV, and V (2300 BC - 1750 BC) was the period of gradual development of the city. We have relatively little information about this stage of the existence of Troy. The scarcity of information results from the progress of the archaeological work, and the severe damage done by Schliemann, who dug these layers in search of Homeric Troy, irretrievably damaging the chronology of the layers. The findings from these layers indicate the existence of trade relations between Troy and the early Greek city-states, including Mycenae. Ceramics from Troy III is virtually indistinguishable from the vessels of Troy II. More decorative vessels made on the potter's wheel appeared during Troy IV and V phases. Troy VI (1700 BC - 1300 BC) and Troy VIIa (1300 BC - 1180 BC) represent the peak phase of the prosperity of the city in the late Bronze Age. This is evidenced by the remains of fortifications, far exceeding the previous city walls both in the terms of size and quality. However, also in the case of these layers, the possibility of a thorough examination is severely limited, because the center of the settlement was destroyed during the leveling of land for the construction of the Temple of Athena in the Hellenistic period. Moreover, a part of this layer was dug by Schliemann without conducting proper documentation. It is now known that during this period the city was surrounded by massive walls, encompassing the inner area of ​​2 hectares. These walls were 5 meters wide and 10 meters high. Inside, there were large detached two-storey buildings, 35 meters long, situated along cobbled streets. The method of their construction - with stone blocks and no windows on the ground floor - can attest to their defensive character. Researchers wonder whether the threat to their residents came from outside, or was the result of conflicts between different clans living in the city. 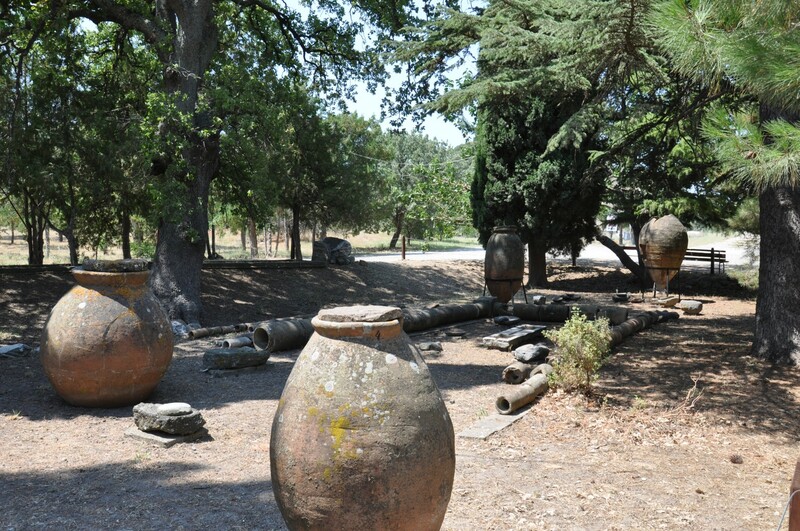 The buildings belonging to Troy VIIa had a different appearance than the palaces of Troy VI as they were smaller and had well-stocked pantries in the form of massive vessels buried in the floor. Their different nature is the evidence of social change. Both layers - VI and VIIa - were rapidly destroyed, for unknown reasons. This is evidenced by the fallen stone blocks and the traces of fire. The hypothesis put forward by Blegen says that these are the traces of an earthquake, but not all researchers agree with this theory. Apart from the buildings inside the citadel, outside the city walls developed the so-called Lower City. It was surrounded by two moats, of which the inner one demarcated an area of 30 hectares, and the outer one - an even more extensive area. 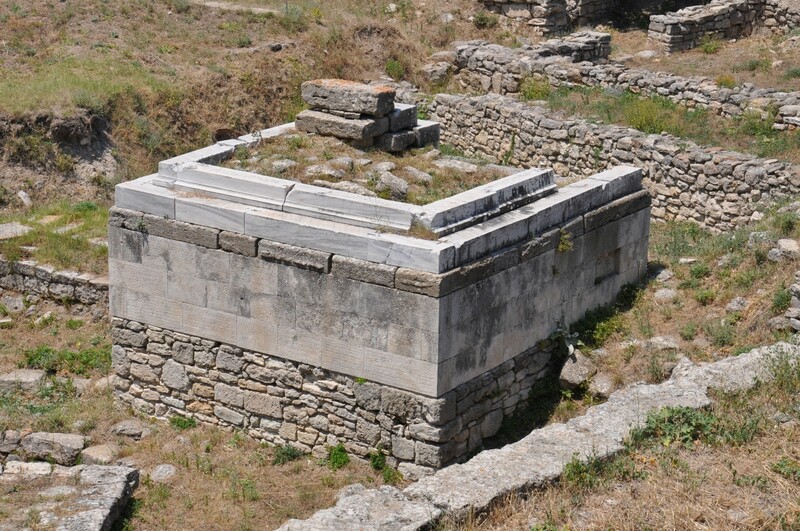 It is the evidence of the demographic development of the city in the period of Troy VIIa. In the period of Troy VI, its residents began to use horses for the first time. The finds from Troy VI and VIIa, mostly gray ceramics, testify to the strong ties with Greek civilization. Several vessels imported from Crete, Mycenae, Cyprus, and the Levant have also been found. There is the absence of any signs testifying to relations with Hittite civilization, which at that time was developing in Central Asia Minor. 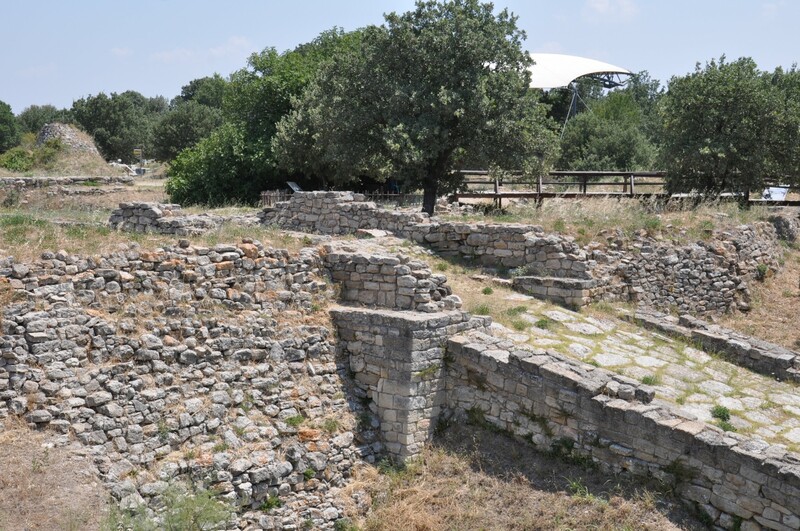 Troy VIIb (1180 BC - 950 BC) was established on the ruins of Troy VIIa. The houses inside and outside the citadel were rebuilt and fortified, and the wall was repaired. The finds from this period, including Protogeometric ceramics, testify to the transition to the Iron Age settlement. The end of this settlement came with another fire, traces of which are visible on some buildings. 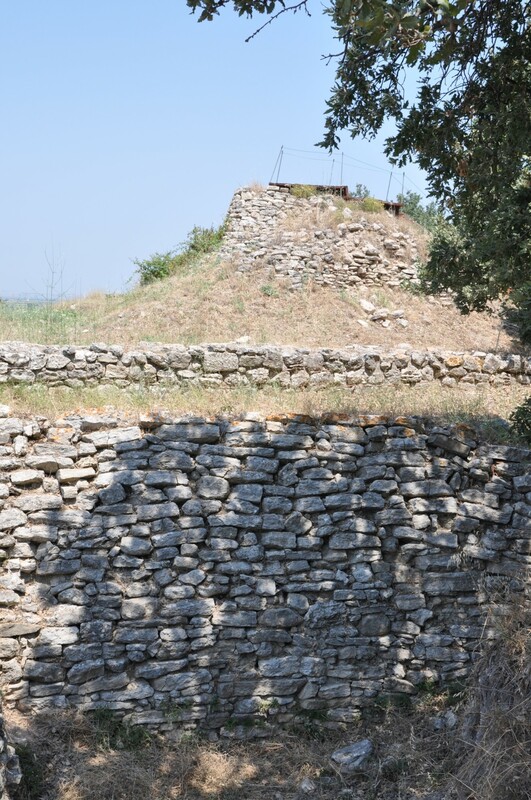 In the period between Troy VIIb and Troy VIII (950 BC - 700 BC) no traces of settlements have been identified, which means that at that time the hill was uninhabited, or it was only a very insignificant village. Troy VIII (about 700 BC - 85 BC) represents the time of restoration of the city, which occurred after the colonization of the area by Greek settlers. The temples and altars were erected in the Archaic style. After the visit of Alexander the Great in 334 BC, Troy, then known as Ilion, became a central hub for a confederation of the cities of the Troad. In this time, many splendid public buildings were erected, including a theater and a magnificent temple of the goddess Athena. In the 80s of the first century BC, Rome waged war in Asia Minor against the ruler of Pontus, king Mithridates VI. Many Greek cities, including Ilion, granted their support to Mithridates, and were severely punished after his defeat. Ilion was ravaged by a Roman leader called Gaius Flavius Fimbria, who was famous for his exceptional ruthlessness. Troy IX (85 BC - 500 AD), which was soon rebuilt on the ruins of Troy VIII, was called Ilium. 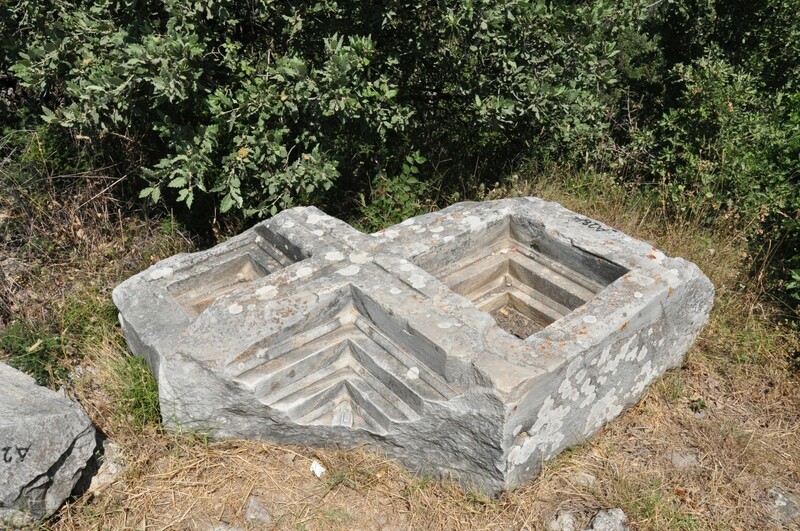 It was a Hellenistic-Roman city, and the most interesting findings of this layer are an odeon and a bouleuterion. The development and prosperity of the city resulted, among other things, from the cherished belief about the relation of Ilium with the mythical Troy. After all, Roman emperors, especially from the Julio-Claudian dynasty willingly traced their descent from the Trojan royal family. After the fall of the Western Roman Empire, Troy fell into disrepair, and was gradually forgotten. With time people ceased to believe in its existence, and the story of the Trojan War has been preserved only in the form of Homer epic poem. Although the discovery of Troy is usually attributed to a German amateur archaeologist and adventurer - Heinrich Schliemann, the matter is actually somewhat more complicated. The existence of the mound called Hisarlık was first recorded by Franz Kauffer in 1703. In 1801, Edward Daniel Clarke associated this location with the legendary Troy. In 1822, Charles MacLaren also stated that Hisarlık had been the place where the Trojan War described in the Iliad had been fought. At the same time, however, the search for the proper Homeric Troy was carried out in the region of the Troad, as many researchers supposed that it had been hidden in a different location. The person responsible for the confusion was ancient geographer Strabo. He claimed that the mythical Troy and Ilion that existed in his days were two entirely different cities. In the 19th century, many scholars pointed to Pınarbaşı village, located about 10 km south of Hisarlık, as the most likely location of Troy. The first archaeological excavations at Hisarlık were conducted in 1856 by an officer of the British Navy - John Burton. His work was continued in the years 1863-1865 by Frank Calvert, an amateur researcher, who lived in the region. However, the excavations conducted by Calvert did not reach the layers from the Bronze Age. 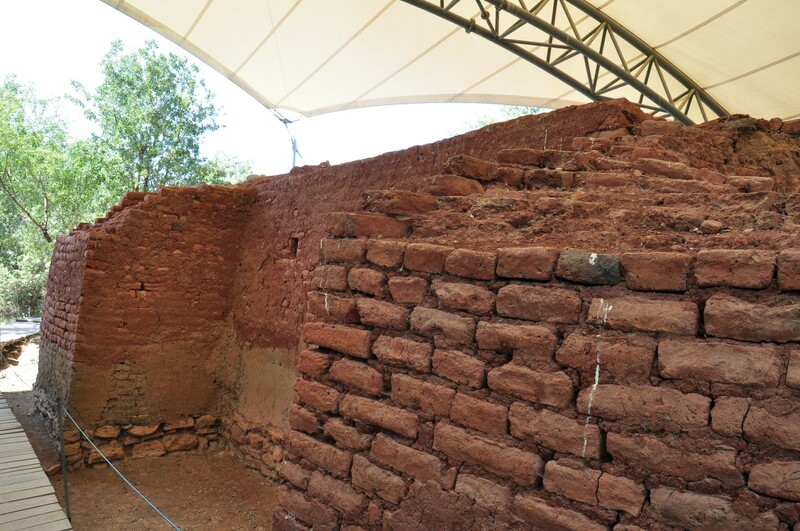 When Heinrich Schliemann arrived at the Troad in 1870, he began archaeological excavations in Pınarbaşı, but very modest finds were very disappointing. When he was about to abandon the further search for, Calvert pointed out the location of Hisarlık. Schliemann acquired necessary permits to conduct research, and from 1871 until his death he repeatedly returned to Hisarlık, where he excavated the mysterious mound. The notion that Hisarlık is the place where the Trojan War had been fought is the result of an intensive promotional campaign conducted by Schliemann. Schliemann, eager to find the dreamed-of Troy described by Homer, led the excavations in a manner that caused more harm than good. His work destroyed some of the upper layers of the city, including - as it later turned out - the fragments the settlement that had belonged to Troy of Homer's epic. In 1873, one of the most sensational discoveries was made by Schliemann. He found a rich collection of objects, consisting of copper pots, bronze weapons and, what was most important to him, silver and gold jewelry. Schliemann announced to the world that he had found the so-called King Priam's treasure, and magnificent gold necklaces and earrings once belonged to the beautiful mythical Helen. In fact, as demonstrated by the dating of the layers of Troy settlements, carried out later by Carl Blegen, these items were much older. Finally, they were assigned to Troy II (i.e. to the middle of the third millennium BC), which existed 1,200 years before the destruction of 'Homeric' Troy. Schliemann secretly took away the rich collection of finds from Asia Minor. The scientific world and the Ottoman authorities learned about this fact when his wife - Sophia - began to show up in antique jewelry in public. Schliemann lost the permission to conduct excavations in Troy. He recovered it later in exchange for the return of the treasure. Some items of the treasure are now in the collections of the Archaeological Museum in Istanbul. However, the most outstanding exhibits were taken to Germany, where they remained in the Royal Museum in Berlin until 1945. In this year, the collection disappeared in the mysterious circumstances. It was only in 1993 when it reappeared in the Pushkin Museum in Moscow. Since then, multiple efforts have been made for their return, undertaken both by the German and the Turkish authorities, so far - to no avail. Those of you who are interested in the fascinating biography of Heinrich Schliemann, an amateur archaeologist, a polyglot and, unfortunately, from the point of view of modern archeology, a vandal, should refer to the extremely interesting book Gods, Graves, and Scholars by German writer C. W. Ceram. The excavations at Hisarlık were continued by Wilhelm Dörpfeld - German archaeologist and architect, in the years 1893-1894. He had begun the adventure with Troy earlier, in 1882, as an assistant of Schliemann. After Schliemann's death, as the manager of excavations, Dörpfeld corrected many erroneous conclusions of his former supervisor. 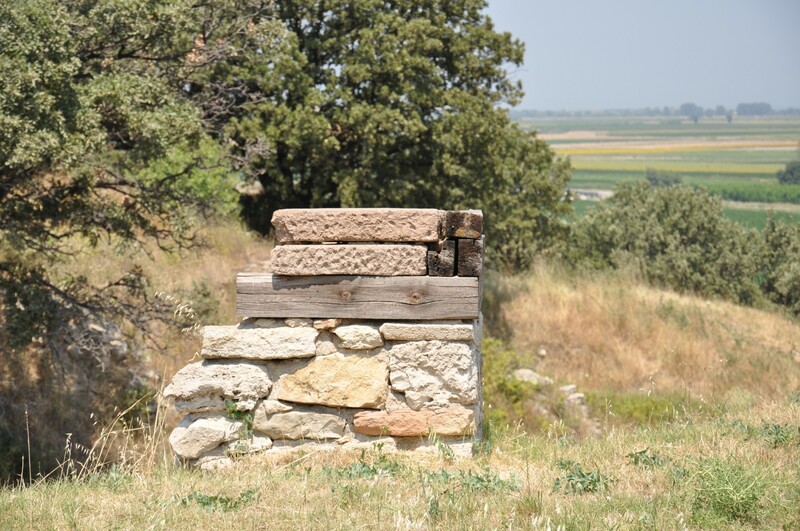 After a break of almost 40 years, archaeological work at Hisarlık began in 1932, under the leadership of an American archaeologist Carl Blegen and his team from the University of Cincinnati. During the excavations that continued until 1938, it was established that Troy could be divided into nine main layers corresponding to the cities that existed in this location for many millennia. Blegen even proposed the further subdivision into 46 levels. Another break in the archaeological work lasted until 1988, when Professor Manfred Korfmann, also of the University of Cincinnati, became the director of Troy excavations. At the same time, Professor Charles Brian Rose was responsible for the study of the youngest layers of the city - Greek, Roman, and Byzantine. Manfred Korfmann devoted 17 years of his life to studying Troy. The greatest discovery made while Korfman was responsible for the Trojan excavations, is the determination that Troy was much bigger than it had been initially thought. In addition to the location on Hisarlık mound, the ancient city covered a wide area around it. Another sensational discovery is associated with the signs of a fight in the city, in the form of bronze arrowheads and human remains, dating to the beginning of the 12th century BC. These items ignited the imagination of many people and restarted a heated debate on the authenticity of the events known as the Trojan War. Because of Korfmann's activities, the interest in Troy on international arena increased significantly. In 1996, he assisted Turkish authorities to establish a National Park covering the areas adjacent to Troy. Two years later, Troy became a UNESCO World Heritage Site. A year before his death in 2005, Professor Korfman received Turkish citizenship as a token of gratitude for his achievements. He also adopted a middle name - Osman - officially, as for many years he had been known as Osman Bey. 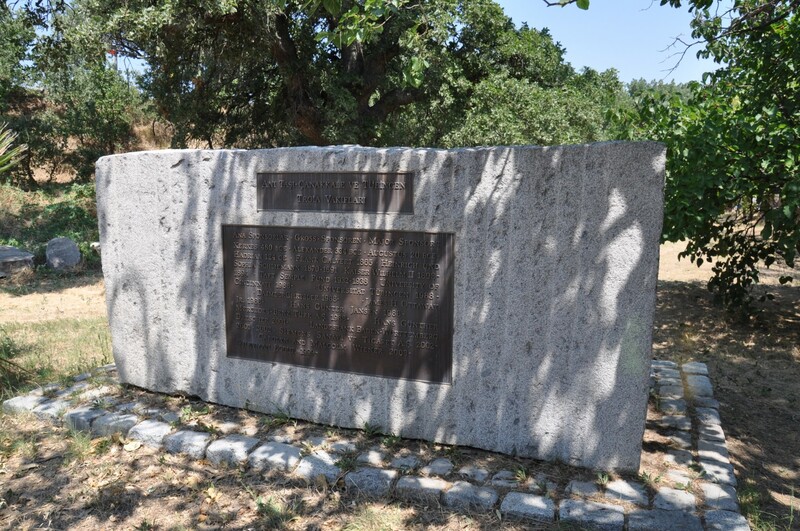 After his death, a library bearing his name, containing his collection of books, publications, and documents was opened in the nearby Çanakkale. A team led by Ernst Pernicka of the University of Tübingen continued Korfmann's work from 2006. However, in recent years, the excavations at Troy became the subject of a dispute. In 2013, an interdisciplinary team of researchers, led by William Aylward of the University of Wisconsin, with the patronage of the University of Çanakkale, was supposed to start working in Troy. However, a few days before the beginning of the expedition, the Turkish authorities withdrew the permissions to conduct the excavations for a hundred participants, including the director. In March 2014, it was announced that new research was planned at Troy, sponsored by a private company and directed by the University of Çanakkale. This was the first Turkish team working in Troy, and Professor Rüstem Aslan was appointed as its director. Visiting Troy is a challenging task, even for hardy travelers who have already visited many ancient ruins. Many people are confused by a multitude of layers of the settlement on the hill, and the effects of intensive archaeological work. Fortunately, the area open to the public has an excellent infrastructure, which consists of marked paths, platforms, viewpoints, and information boards, which you should study carefully to get the best of the tour. Below the key points on the route are presented. This route is well marked by signposts, and leads the visitors along a loop, returning to the starting point - the Trojan Horse model (No. 1 on the map). The building, located near the entrance to Troy ruins, formerly served the teams of archaeologists and currently hosts an exhibition of models and photographs of Troy. Behind this mysterious name hides an enormous collection of pottery, known in classical Greek as pithos. These vessels were up to 2 meters in height and were used to store and transport food. In addition to this exposition, there are ancient terracotta water pipes and stone mortars for grinding grain. It is not a relic from the excavations of Troy, but a symbolic block of granite weighing 20 tons, obtained in the area of Troad. It was donated to the Foundation of Troy in 2002, as a symbol commemorating the fact that Troy was one of the first places on the border between Asia and Europe, where hewn stones masonry was used for the first time. The first examples of the use of this technology in Troy date back to 2,500 BC that is to the Bronze Age. This technology was applied to build Megaron II A, as well as many other structures belonging to the layers of Troy VI-VIIa. After the Eternal Stone of Troia, the sightseeing route of Troy turns right and leads to the fortifications from the times of Troy VI. In the beginning, it is worth paying attention to the remains of the defensive tower. Before you approach closer, stop on the viewing platform, which offers a panoramic view of this part of Troy. The outer walls (on the right side, looking from the platform) are very different from internal walls, slanting to the center of the settlement. This is due to the fact that this part of the external walls was erected later - it was a fence of the outer courtyard of the Temple of Athena. 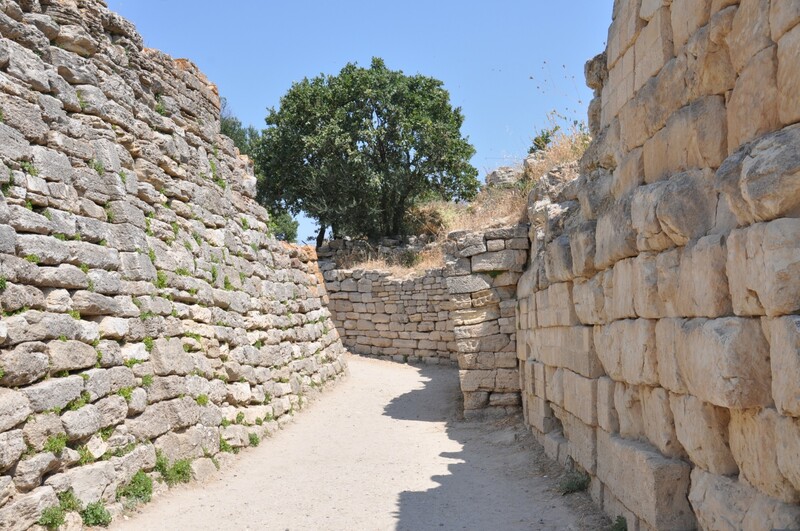 The gate leading to Troy VI was placed between two lines of defensive walls - external and internal, overlapping as a spiral. At this point, there was a gate, invisible from the outside and impossible to force using a battering ram as there was no place for its use. In this place, you see also the connection of the temple walls from Troy VIII and the walls of Troy VI. This is the most massive tower belonging to the citadel of Troy VI. It once rose to a height of 9 meters, and now its ruins are 7 meters high. In the period of Troy VIII-IX this area was built up with the walls surrounding the Temple of Athena. Almost nothing has been preserved from the Temple of Athena, that belongs chronologically to Troy VIII and IX. You can see the foundation of the altar and fragments of roofing scattered around the area. Unfortunately, even before the "discovery" of Troy by Schliemann, local people had known where to obtain excellent building materials. The temple was build as an initiative of Lysimachus, one of the generals of Alexander the Great. The temple, built around 300 BC, was later renovated at the time of the Roman Emperor Augustus. It is known that its plan had the dimensions of 36 to 16 meters and that the temple was surrounded by a colonnade of Doric order. The temple was the center of the annual celebration in honor of the goddess Athena. One of the best-preserved parts of the building - the relief depicting Apollo/Helios - is currently exhibited in Berlin. It is a very distinctive place in Troy - easily recognizable by modern roofing resembling the sails of a ship, erected in 2003. Most of the visible fragments walls of red brick is a modern reconstruction. The original bricks are inside the wall and go up to a height of 4 meters. Megaron of Troy II/III is located just off the red walls. The term 'megaron' describes a building typical of the ancient culture of the Aegean area, consisting of one covered room and an open atrium. This plan became a prototype of the Greek temples. The Megaron of Troy had stone foundations. A part of the wall, reaching up to 1.5 meters, has been preserved to our times. Fortification Walls of Troy I constitute the most ancient layer of Trojan buildings. These walls were erected on bedrock, which means that underneath there are no traces of human activity. In this stretch of the walls there was a southern gate, 2 meters wide. The walls are tilted slightly to the inside of the settlement. The settlement was a roughly circular area, with a diameter of 90 meters. At the defense tower, that forms a part of these fortifications, a fascinating stele has been found. It is adorned with a relief showing the upper half of the human body. The residences for the wealthiest residents of Troy consisted of three parallel buildings (megarons). The largest of them had a size of 30 to 14 meters. 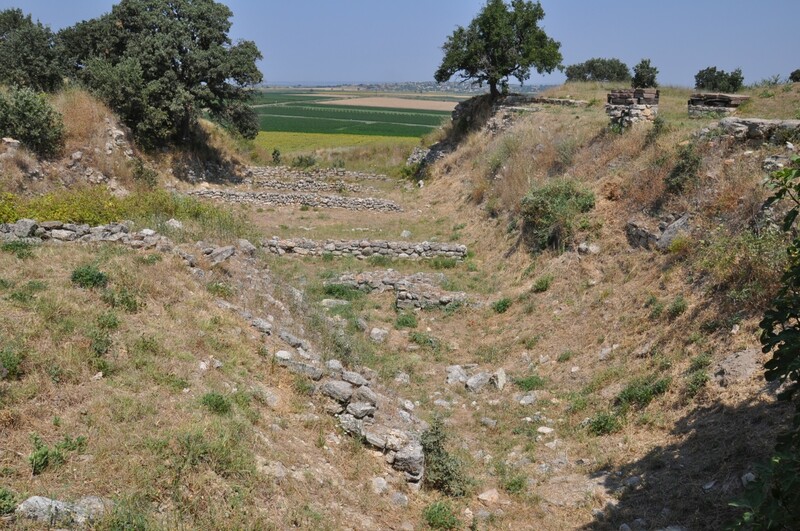 Schliemann's Trench is a reminder of the actions of the famous "discoverer of Troy" - Schliemann. In search of the castle of King Priam described by Homer in the Iliad, Schliemann made a huge trench in Hisarlık mound. Today it is an illustration of how not to proceed in archeology. The trench, oriented in the direction north-south, is 40 meters wide and up to 17 meters deep. Schliemann conducted his excavations reaching down to bedrock and destroying the newer layers of settlement. At the bottom of the trench, there are visible remains of the walls of Troy I. The rows of stone walls are the foundations of houses from this period. A perfectly preserved paved ramp led into the interior of Troy II. Researchers have discovered that this ramp was situated below a huge tower, under which ran the corridor. Near this place, Schliemann found the so-called Treasure of Priam. Not much has been preserved from the Palatial Residence of Troy VI. It reportedly had two floors. Schliemann called this building "the Palace of Priam". However, large vessels for storing food, discovered here, testify to the fact that, at least for some time, it was actually a warehouse. Visible remains of buildings date back to the period of Troy VIII and IX. They were erected on the ruins of earlier buildings of Troy VI and VII, perhaps also serving some religious purposes. The best-preserved structure is an altar of so-called Lower Sanctuary. There are also two wells, one of which was used for collection of the blood of sacrificial animals, and the second one - for drawing water. Temple complex was built during the Archaic period of ancient Greece, but the sanctuary was also used later, during the Hellenistic and Roman times, with some modifications. It is not known which gods were worshipped here. The Lower City of Troy VI/VIIa is located outside the citadel, to the west. Stone foundations of numerous houses have been identified here. The most spectacular finds from the Lower Town include a bronze statuette and a terracotta bull figurine. Excavations are still being conducted in this area of Troy, bringing new, exciting discoveries. Water Cave of Wilusa is a place rarely visited by tourists. 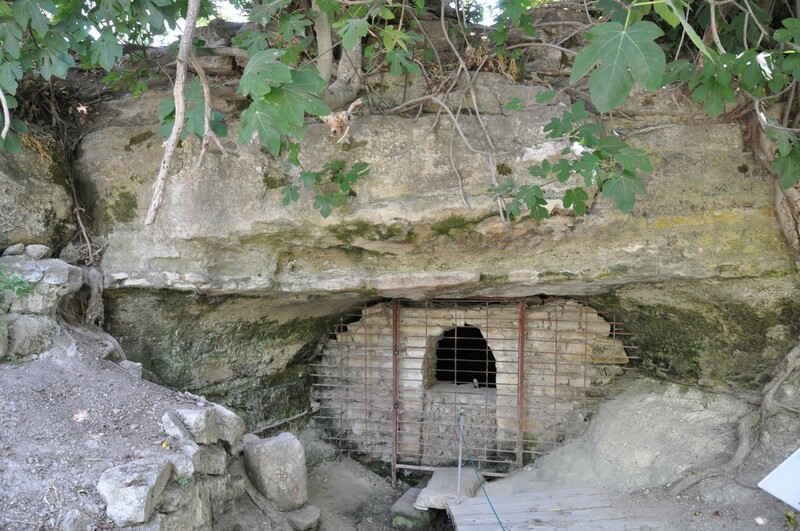 The distance from the Lower City of Troy VI/VIIa to the cave is about 150 meters. The path leads you along the fields and meadows. The signposts leading from the hill to the cave are quite inconspicuous and easy to miss. The cave is a relatively new archaeological discovery, as it was discovered and studied in 1997-2001. Surprisingly, it is an artificial cave, not a work of nature. A 160-meter-long corridor cut in the rock heads eastbound. It is connected to the surface by four vertical shafts with a height of up to 17 meters. The corridor was made in the third millennium BC. It means that in the heyday of Troy VI the cave had already been in use for a thousand years. The cave was called "an underground corridor" and associated with a water deity KASKAL.KUR. It is mentioned in the treaty concluded between the Hittite king Muwatalli II and King Alaksandu of Wilusa (as Troy was then called). The King Alaksandu took an oath, invoking the deity. On the right side of the path, you can see the ruins of Roman baths. Little has survived of this building, and its floor was once adorned with beautiful mosaics of colored stones. Odeon was a small theater used to enjoy music performances. It dates back to the Roman times, probably to the end of the first century AD. Decorated with marble blocks, lying in front of the odeon, were once a part of its scene. Bouleuterion was a place of political gatherings. 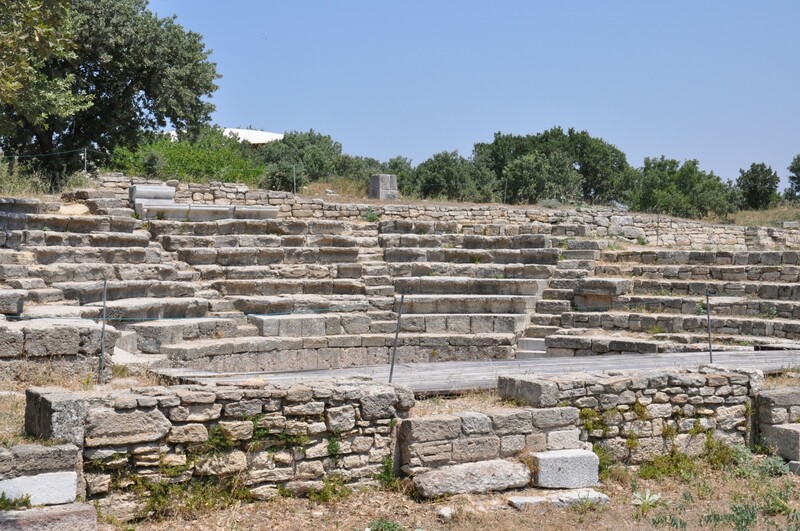 The bouleuterion in Troy, originating from the time of Augustus, still has a podium and the first row of marble seats. In 2012, plans were announced to open a new museum facility - the Trojan Museum, which is to operate next to the ruins of Troy. The selection of the project of the building was an important event, and many Turkish and foreign companies took part in the competition. The construction work is currently underway, but the museum is supposed to be opened in 2016. If you are planning to visit Tory this year, perhaps you will have the opportunity to be among the first guests at the facility. Troy is a historical site inscribed on UNESCO's World Heritage List (in 1998). Visiting the ruins of Troy is possible every day during the opening hours: in the summer season (April to October) from 8:00 am to 8:00 pm, and in the winter season (November to March) from 8:00 am to 5:00 pm. A ticket costs 20 TL. Small children enter for free. Note: the ticket office closes one hour earlier. The car park next to the entrance is free of charge. Unfortunately, it is almost entirely unprotected from the sun. Take advantage of the few shady spots under some trees in the corner of the parking lot. Troy can be visited individually, and you are assisted with the information boards (in English, German, and Turkish). You can also hire a guide for the tour. A guided tour takes about 1.5 hours. By public transport: there are regular minibuses connecting Troy with Çanakkale. Minibuses depart from Çanakkale every hour between 9:30 am and 4:30 pm (in summer till 7:00 pm). The ride costs around 5 TL, and takes 40 minutes. 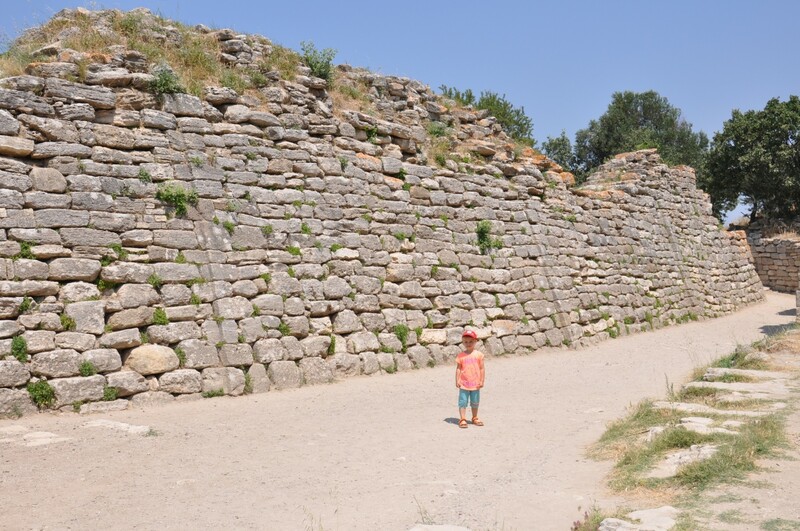 Please note the last return minibus from Troy to Çanakkale departs at 3:00 pm (5:00 pm in summer), which means that you might need to stay in Troy if you decide to visit this site in the afternoon as there are no other public transport options in the evenings. By taxi: it is possible to organize a taxi tour from Çanakkale to Troy and back, and the price depends on the result of negotiations with a driver. By car: take D550 route from Çanakkale, and turn to the west after 26 km. The turnoff is clearly signposted, and the total distance from Çanakkale is 30 km. With an organised tour: travel agencies from Çanakkale and Eceabat organise tours of Troy, for around 60 TL. Hisarlık Hotel - closest to the entrance to Troy. It is a facility run by the family of the renowned Trojan guide Mustafa Askin. The hotel features simply furnished rooms at affordable prices (around 100 TL for a double room with breakfast). On the ground floor of the hotel, there is a restaurant serving freshly prepared traditional Turkish dishes. Despite the proximity to Troy and the lack of competition, the dishes are truly delicious, and the prices - reasonable. Dinner dishes, for example moussaka or güveç (casserole with meat), cost around 12-15 TL. At the restaurant, there is also a gift shop selling postcards, brochures, and books about Troy, as well as miniature Trojan horses. It is worth comparing the prices offered here to the prices of goods in the official museum shop in Troy. An unusual sight is a wooden hut, adjacent to the hotel. It was commissioned by German television during the filming of a documentary film about Heinrich Schliemann. It reproduces the actual residence of famous treasure hunter, where he lived while working in the area of ​​Troy. Troia Pension - located just 100 meters to the west of Hisarlık Hotel. This is a relatively new guest house, run by another experienced guide - Urvan Savas. The facility has only four rooms, priced at around TL 130 with breakfast. The pension has a restaurant and a gift shop. The big advantage of this facility is a possibility of camping in the garden for a small fee.